The wonderful world of a beehive has long been known as the location where our honey bees make honey. What many don’t know is that honey bees make and collect other products for the hive. Those products can be extracted and utilized by us in our daily lives. 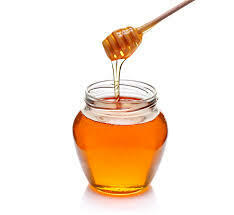 Honey is the most common product of the hive. Honey is the most commonly thought of product that comes from the hive. Honey bees collect nectar from the hundreds of flowers they visit in a day. That nectar gets returned to the hive where it is deposited into a honey comb cell. The nectar is then fanned by a worker bee’s wings to get a lot of the moisture out for it to be turned into the honey we enjoy. Honey can be used for cooking instead of granulated sugar, for treating minor cuts and scrapes, and is a great remedy for treating a sore throat. Beeswax is made from honey bees' bodies. Honey bees produce tiny scales of beeswax from their body that they use to build up the honey comb and cover the nectar that has been turned into honey. Beeswax that is extracted can be used to make beeswax candles, lip balms, and other skin care products. Pollen is collected by honey bees to be used as food. When a honey bee visits flowers to collect nectar, it is also collecting pollen. The pollen collected is stored on the back two legs of the bee on their pollen baskets. The pollen collected is returned to the hive where it is stored in a honey comb cell to be used for food. Some people use pollen as a protein supplement. They add it to their cereal, yogurt, or even in smoothies. A worker honey bee has glands on their head that produce a special liquid we call royal jelly. This jelly is crucial for growing queen bees, but humans also use it. Royal jelly contains botox, which prevents wrinkles, it is shown to help with wound care and can be found in skin and hair care products like the shampoo I use!